Welcome SkyWatchers! I invite you to follow my blog or subscribe to my feed. This is the giant bur oak my wife and our 10 day old son (pics here) have in our backyard. I took this picture last evening of this incredible sunset right here in Worthington, Ohio, hanging out the window of our upstairs bathroom. Great sunset with nice colors. Beautiful - I love that deep red against the blue! simply delightful. what beautiful colors. Congratulations on having a 10-day-old son! Lovely view your wife and he has! Gorgeous sunset and also a great tree you have. Absolutely beautiful! Ten-DAY-old son? Congratulations! I'll bet you're not getting much sleep... You will probably be able to shoot the sunrise, too. :) Happy SWF. What a magnificent tree and what a magical view to see from the comfort of your own home. Such heavy contrasts in this picture. Makes it very powerful. Welcome to the world Weston!! What a beautiful tree, against an equally beautiful sky. Great shot of the sunset and oak, Tom. Is Weston ready for his first botanizing field trip yet? Wonderful - orange/red seem to be today's sunset colors! Tom: Really nice, I noticed something was going on but didn't go outside. Shame on me for missing it. Very nice pic, I love the colors. Dramatic! 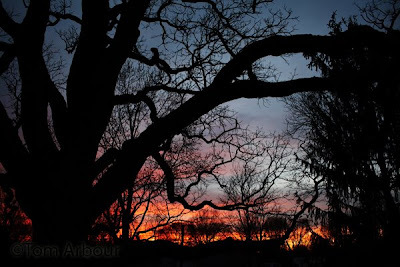 Love the tree in silhouette to the great blue and red! It looks as if your oak is absorbing the beauty of the sunset. Wonderful colours in the sunset, Congrats on your new baby. gnarly tree. this is great! Wow! I love the color, nice camera and nice photographer too! wonderful shot. Thank you everyone, happy Sky Watch. Beautiful sky from your own window! looks like the background is burning... very nicely done. Oooh...Very nice. I love the silhouette of the tree against those colors.